Lobster cocktail, roasted goose, cheese hedgehogs, semolina dumplings … an old-fashioned menu? Not really, just good food the way it was made in simpler times. That is what was on the menu in Lufthansa’s First Class on their heritage flight for the 60th year anniversary of their North Atlantic route from Frankfurt to New York onboard the retro 747-8 Yankee Tango jet. LSG Sky Chefs was asked by Lufthansa to develop a culinary concept for this anniversary flight – a challenge we took on immediately, with great enthusiasm and as a team. Colleagues from Product Development, Sales, Procurement, Culinary Excellence and our frozen food subsidiary LSG-Sky Food created a retro menu in order to offer the passengers onboard a very special culinary flight experience. My personal highlight was that we prepared all meals together. Development chefs, as well as chefs from our Lufthansa unit in Frankfurt, worked in the same kitchen preparing starters, main courses and desserts. And it was not only the guests in First Class who were able to appreciate the typical cuisine of the 1950s. Passengers in Business, Premium Economy and Economy Class also had retro choices. 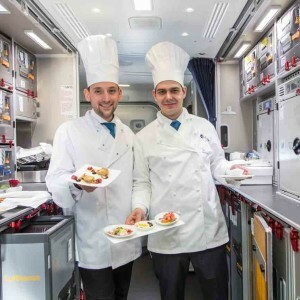 In order to improve the catering service even further, LSG Sky Chefs put two chefs onboard who took over the preparation of the meals in First and Business Class. They were also available for questions from the passengers, just like in the 50s. This project was a lot of work, but also lots of fun for everybody involved. And it was an excellent team achievement with which we were able to shine for Lufthansa and their passengers.